Murder by Gaslight: Guilty of Murder. 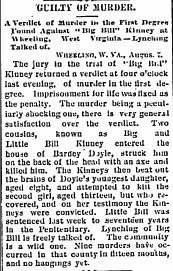 A Verdict of Murder in the First Degree Found Against "Big Bill" Kinney at Wheeling, West Virginia—Lynching Talked of. Wheeling, W. VA., August 7. The jury in the trial of “Big Bill” Kinney returned a verdict at four o’clock last evening, of murder in the first degree. Imprisonment of life was fixed as the penalty. The murder being a particularly shocking one, there is very general satisfaction over the verdict. Two cousins, known as Big and Little Bill Kinney entered the house of Barney Doyle, struck him on back of the head with an axe and killed him. The Kinneys then beat out the brains of Doyle’s youngest daughter, aged eight, and attempted to kill the second girl, aged thirteen, but who recovered, and on her testimony the Kinneys were convicted. Little Bill was sentenced last week to seventeen years in the Penitentiary. Lynching of Big Bill is freely talked of. The community is a wild one. Nine murders have occurred in the county in thirteen months and no hanging yet. "Guilty of Murder." Huntsville Gazette 9 Aug 1884: 1.